Because boundaries are frequently described so poorly in conveyances, a number of legal presumptions have been adopted as a means of filling gaps in the evidence. These presumptions may be rebutted by evidence to the contrary. The presumptions are thus not definitive and must be used with caution. The various presumptions that are sometimes applied are discussed below in alphabetical order. If someone owns land bounded by a beach then the boundary is usually taken to be the mean high water mark. The holidaymaker using the beach would normally consider the beach to extend beyond the high water mark and up to some change in vegetation or to a man made feature such as the edge of a road, and would be surprised to learn that he might be on private land. The area between the high and low water marks is swept by the tides and may be subject to erosion or accretion. In the case of accretion, the owner of the land to the landward side of high water gains land as a result, whilst in the case of erosion the landowner loses land. Canals are presumed to have been dug on land belonging to, or acquired by, the canal's operator. Land adjoining a canal must therefore be bounded by the edge of the canal's land, and not by the centre of the waterway. Fences will normally be presumed to have been erected by the owner of the land on which they stand such that the the boundary runs along the outer face of the fence. This presumption applies only to agricultural land. The presumption holds that where two properties are divided by a hedge and a ditch, the property boundary is presumed to be on the opposite edge of the ditch from the hedge. This is based on the principle that the owner would have stood on the boundary facing toward his own land, dug the ditch on his own land, piled the spoil on his home side to form a bank, and planted a hedge on the bank. Although the hedge and ditch presumption applies only to agricultural land, there are numerous examples of a hedge and ditch boundary surviving the development of a housing estate on either side of it. If a boundary dispute should arise between two properties that stand one either side of this former agricultural hedge and ditch then the presumption is usually still applied. Sometimes the hedge and ditch presumption may be rebutted by careful observation of the terrain. Normally, the hedge sits atop a bank and the boundary is to be found on the far lip of the ditch from which the material for the bank was excavated. In the drawing below, A claimed that the boundary followed the far lip of the ditch, whilst B claimed that the boundary was in the hedge. 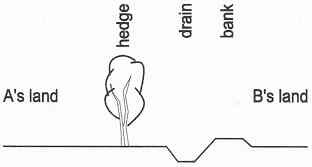 When you examine the drawing below you will see that the hedge does not stand atop the bank, and so this is not a hedge and ditch boundary. In fact the purpose of the ditch is to provide drainage for B's flat land that suffers from waterlogging every winter, and the drain was dug by a predecessor in title of B. There are other circumstances, based on an interpretation of the words of a conveyance, that might rebut the hedge and ditch presumption. One such is when a conveyance specifically identifies a parcel of land by its parcel number (also known as a field number) shown on the Ordnance Survey map. The presumption is that the parcel number implies that the boundary of the land conveyed is the line on the map that encloses the measured area that is identified by the OS parcel number: where that line follows a hedge and ditch boundary then it is the centre of the hedge that is represented by that line, and not the outer rim of the accompanying ditch. This is not so much a legal presumption as a matter of convention or common practice in rural areas. Where a hedge was planted on level ground (i.e. not a hedge and ditch situation) it was the custom to plant that hedge at a certain distance from the boundary. The actual distance varied from parish to parish. In order to establish the distance used in a given parish it is necessary to research the matter at the Public Records Office in Kew by looking for the (often nineteenth century) field notes of the Ordnance Survey staff who accompanied the Boundary Commission. Similar conventions apply to Cornish hedges and to Devon banks. It should go without saying that the above conventions do not apply to a hedge planted within, but close to the boundary of, a parcel of residential land. It is normally presumed, for lack of evidence to the contrary, that a highway extends to the fences or other boundary features that front the adjoining properties. Such boundary features will normally be the responsibility of the adjoining landowners. Where the bounding feature is an integrated or intended part of the highway, such as a crash barrier, a bridge parapet, or the perimeter fencing of a motorway, then responsibility for that feature rests with the highway authority. If the conveyancing history of the adjoining land and of the road is unknown then the boundary of the adjoining land is presumed to run along the centre of the highway. The surface of the highway is vested in the highway authority but the adjoining landowner owns the land beneath his half of the highway. Because the highway authority acquires a legal interest in the surface of the road Land Registry will not use the centre line of the road as the general boundary, even when the conveyancing history expressly includes half of the roadway in the adjoining property. Where a boundary runs along the face of a building it is presumed that the projecting eaves and footings are conveyed with the house, but that the air space between belongs to the adjoining land. In practice, the transfer deeds of many modern housing developments grant an easement in terms such as: "the right for the eaves gutters and foundations of the Property to protrude into or over and under adjoining plots on the Estate ..."
Where an island is located in a river then the boundaries of the island are presumed to be in the centre of the channel on either side of the river. The location of the boundaries on the upstream and downstream sides of the island is less clear. A lake that is wholly contained within a parcel of land will belong to the owner of that parcel of land. But where two properties in different ownership are separated by a lake there is no presumption as to the position of the boundary. Railways were built on land acquired for the purpose, so the boundary of adjoining land is not the centre of the track but the bounding fence of the railway. Such bounding fences are generally the responsibility of the railway company under obligations imposed on them by the Railways Clauses Consolidation Act 1845. In a non-tidal river the boundary of riparian land is presumed to be in the centre of a stream. If there is an island in separate ownership from the riparian land then the boundary is the centre of the channel between the riparian land and the island. If the bed of the river is sold separately from the riparian land then the boundary follows the water's edge. Where the riparian land grows slowly in size as a result of accretion then the additional land belongs to the riparian owner and the position of the boundary in the centre of the water course is automatically adjusted. If the river suddenly completely changes its course the boundary remains where it was immediately before the diversion. 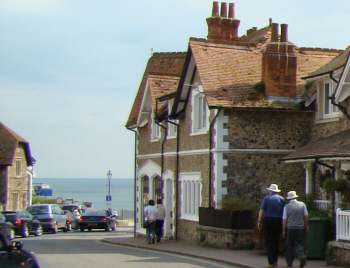 The seashore (which is synonymous with foreshore) is the area between the mean high water mark and the mean low water mark. Below the high water mark, i.e. the seashore and the seabed, generally belongs to the Crown. Where a parcel of land adjoins waste land, any fencing along the boundary is presumed to belong to the land adjoining the waste land and not to the waste land. The information given on this web site is of necessity of a very general nature and cannot be relied upon to meet your specific requirements. Neither Jon Maynard FRICS nor Jon Maynard Boundaries Ltd can be held responsible for any action that may or may not be taken by anyone who accesses this site and acts on the basis of any information found within. Whilst it is hoped that the reader may gain benefit from the information in this site, liability can only extend to specific advice given by Jon Maynard FRICS after completion of a formal engagement letter. Please don't telephone us expecting an instant answer to a quick question about your fence, boundary or right of way. Every case is different and the circumstances of your case will be a long story: we need to see documents relating to your land to give a meaningful answer. If you don't want to book and pay for a Boundary Advisor Telephone Consultation then you are most welcome to read the completely free Boundary Problems web site.